Some of us have a “sweet tooth”, and yes, while eating a balanced diet with less sugar our cravings should reduce, we still like to indulge every now and then. Or maybe it’s a special occasion and you need something as a sweet component on your menu. You don’t always have to go down the road of lengthy and involved recipes. These chocolate covered almond butter stuffed dates don’t require baking and call for only 4 ingredients! There are probably hundreds of different flavor pairings that go well with dates which is what makes them so versatile. Here we chose almond butter and dark chocolate. The sweetness from the dates mixed with the nutty and bitter flavors make an irresistible bite. Pop one or two in your lunch box for a mid-day snack, or serve them as a sweet ending to a hearty Paleo meal. You can truly dress them up, or dress them down. Dates are a great vehicle for sweet or savory pairings, but keep in mind they are packed with sugar. And sugar is sugar, even if it’s natural. So even though eating these stuffed dates by the mouthful may be tempting, try to use some discretion. If you have a tree-nut allergy sub coconut butter as a stuffing for something just as tantalizing. 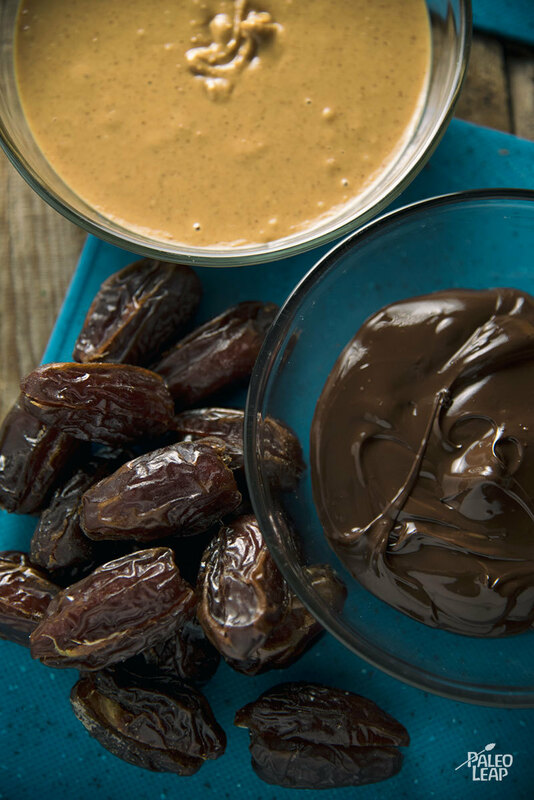 Fill each date halves with almond butter, and connect them back together. Secure with a toothpick. Melt the chocolate in a double boiler over medium heat, stirring until fully melted. 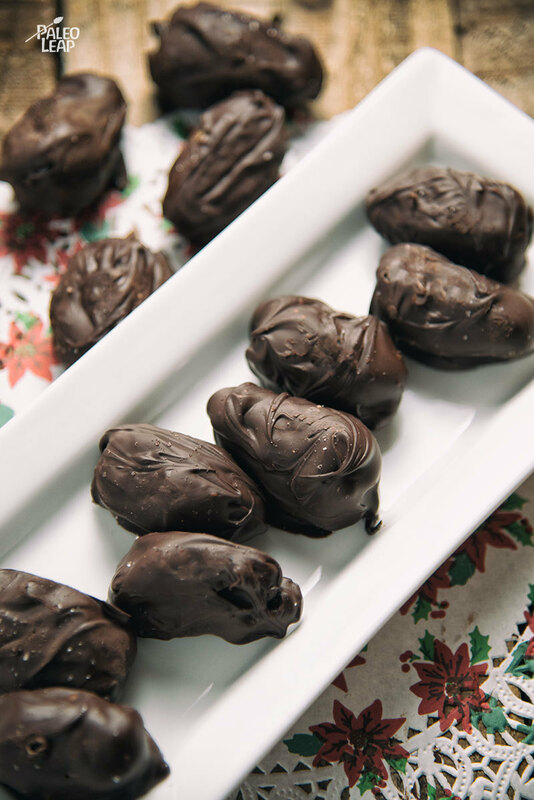 Dip each stuffed date in the melted chocolate, making sure they are well covered, and place on a parchment lined baking pan. Lightly sprinkle with sea salt and place in the freezer for 15 to 20 minutes.